Our friends at ChangeWave Research—voted company most likely to ask you about every little detail of your smart phone habits—have released the results of their latest consumer survey. ChangeWave talked to 4,292 cell phone owners in March, asking about their reaction to Palm’s announcement of its forthcoming Pre smart phone and the features that Apple showed off for its iPhone OS 3.0. While there was a slight dip in the percentage of consumers who said they were planning on buying a smart phone within the next 90 days (compared to December 2008 survey), it was still third highest number ever recorded by the company. Apple’s share of prospective smart phone buyers remained steady since the December 2008 survey, registering at 30 percent, trailing RIM’s 37 percent. 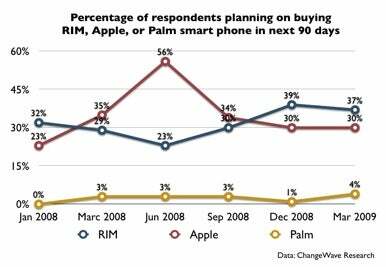 That did mark a steep decline since the June 2008 (pre-iPhone 3G launch) survey had Apple at 56 percent. However, it seems that recent announcement of iPhone 3.0 features has helped Apple out: fully 20 percent of those surveyed said that the iPhone 3.0 features made them more likely to buy an iPhone. That’s a pretty significant impact, given that the majority of Apple’s iPhone 3.0 presentation focused on features available to developers and that the end-user features demoed were not necessarily major, flashy improvements—as welcome as cut-and-paste support is. To me, it implies that consumers realize that the strength of the iPhone is as a platform that has robust third-party application support. As we approach the two-year anniversary of the original iPhone’s launch, it appears that Apple is continuing to keep their mobile devices appealing to consumers, even in the face of increased competition. ChangeWave also threw in a wild card question, asking consumers if, were Steve Jobs to resign as Apple’s CEO, it would have any effect on their purchasing decisions. A sizeable majority—80 percent—said that it would have no effect whatsoever, while only nine percent said that they would be less likely to buy Apple products. The latter number dropped five percent since the question was asked in September of 2008 (at which point 74 percent said that Jobs’s resignation would have no effect). In January, Jobs announced that he would be taking a six-month leave from the company to deal with health issues. That bodes well for Apple and suggests that the public confident that Tim Cook and the rest of the Apple executive team have been ably steering the company during Jobs’s self-enforced leave of absence.